Just the Facts Checkpoint Winner! 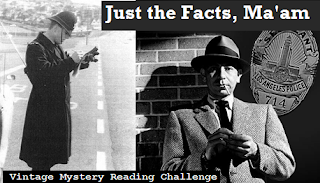 As was the case (pun intended) in the 2018 challenge, participants in the 2019 version of the Just the Facts, Ma'am Challenge will be playing detective. The objective is to answer all the important questions of Who, What, When, Where, How and Why to complete cases in either the Golden or Silver Mystery Eras (or for the more adventurous, both). I have added two more spaces to each category and have changed up some of the items to check off. [Thanks to Kate from Cross Examining Crime for her helpful suggestions!] 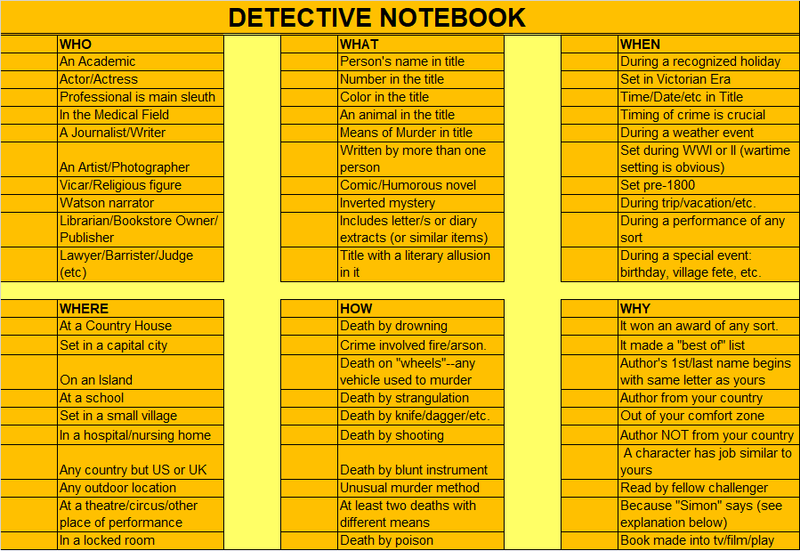 See the Detective Notebooks below. 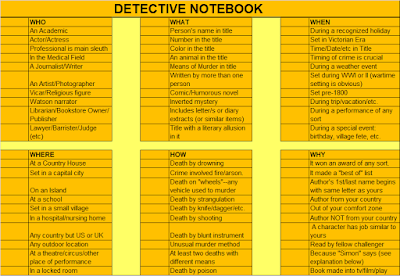 ~All books must be from the mystery category (crime fiction, detective fiction, espionage, etc.). The mystery/crime must be the primary feature of the book--ghost stories, paranormal, romance, humor, etc. are all welcome as ingredients, but not be the primary category under which these books would be labeled at the library/bookstore. ~For the purposes of this challenge, Golden Age Vintage Mysteries must have been first published before 1960. Golden Age short story collections (regardless of publication date) are permissible if they fit a category and provided all stories in the collection were originally written pre-1960. Please remember that some Golden Age authors wrote well after 1959--so keep an eye on the original date and apply them to the appropriate card. Silver Age Mysteries must be first published from 1960 to 1989 (inclusive). Again, Silver Age collections published later than 1989 are permissible as long as they fit a category and include no stories first published later than 1989. Yes, I admit my dates are arbitrary and may not exactly meet standard definitions of Golden or Silver Age. ~To complete the challenge and to be eligible for the participation drawing at the end of the year, participants must earn the rank of Constable: six books read from a single Vintage Era. If you choose to do both eras, you must use separate notebooks. You may not, for example, answer three golden questions and three silver questions to claim the minimum six. ~Challenge runs from January 1 to December 31, 2019. All books should be read during this time period.. Sign up any time until November 1, 2019. Any books read after 2019 begins may count regardless of sign-up date. If you have a blog, please post about the challenge and your commitment--if you're going Silver or Gold (or maybe both). Then sign up using your challenge post url (please, not your home page) via the linky below. If you don't have a blog, links to an online list (GoodReads, Library Thing, etc.) devoted to this challenge are also acceptable OR you may comment below to indicate your sign-up. ~For most of the "Who" category, the who may be the sleuth, victim or other quite prominent character. It should not be a minor character who only shows up once or twice and isn't really crucial to the plot. ~An example for the item "Timing of crime is crucial" might be that X murders Y to prevent an inheritance OR X knocks off Great-Uncle Y to prevent him from changing his will. Just be prepared to explain what the crucial element is. ~For the "Made a best of list" item, the "best of" list can be a well-known list from a journal or newspaper, form GoodReads, or even from a fellow blogger. Please reference the list you have used. ~For "Simon Says"--Simon (that's me!) says to read the book at the bottom of your current TBR stack. If you don't have a stack, but have a TBR shelf--then read the book at the right-hand end of your shelf. If you have so many books that they're not really organized into stacks or shelves, then go to your hoard (list, whatever) and pick a book at random. You're on your honor to not put any thought into it. Just grab one. ~If you have any questions about a category (or anything else challenge-related), please email me at phryne1969 AT gmail.com. ~No double-counting within the challenge--but books may be used for other challenges. If a book qualifies for more than one category, you may only use it to check off one item on your detective notebook. You are welcome to change the item claimed at any time prior to submitting it for a prize drawing. ~Reviews are encouraged, but they are not necessary to participate. ~Please keep track of your progress and be prepared to submit a final wrap-up post or comment. If you do not have a blog (or other means to link up), then post below your intention to join and you can post again at the end-of-year wrap-up site when you have completed your challenge (include a list of books read and categories you completed with any explanations necessary). Please do not submit completion comments prior to the posting of the wrap-up link. Thank you. ~If you post to Facebook, Instagram or other social media to log a book (or about the challenge), please use #JustTheFacts2019. ~The Headquarters link which appears on my sidebar will be updated for 2019 once the new year begins. You can go there for review links and information. Yes, I mentioned prizes above. Since I have added an extra challenge (with prizes) and postage seems to keep going up, I have had to reduce the number of check point prizes this year. 1. There will be a Mid-Point check-in post this year. I will choose specific items ahead of time and keep them in reserve for the check-in drawing. Those who have already checked those items off in their notebooks will be eligible. 2. Challengers who complete the minimum six books from a single era will be eligible for the the year-end prize drawing. 3. 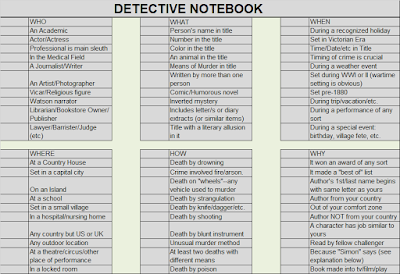 There will be a Super Sleuth prize for the challenger who completes the most items from the notebooks. In case of a tie, there will be a tie-breaker (To Be Determined). I will announce the tie-breaker method before entries are accepted at year's end.